The plan was perfectly set out from yesterday's full day of preparation. All the frequencies were known and written down, all the altitudes were decided upon, the course lines drawn on the charts. I had visualized every last detail, and I had done it several times. There was nothing left but to do it. It is incredible how things can go wrong no matter how well we plan otherwise! The takeoff from Reims (Prunay) was flawless. There was no wind, the sky was clear, and the weather was good enough at LeTouquet, my destination on the north coast of France. However, there is one rather important note on the airport chart for LeTouquet that mentions the unpredictability of the weather in that spot. The note mentions that fog can roll in from the English Channel very quickly and unexpectedly, and that pilots should be prepared to go to an alternate airport. I had therefore identified my alternate and was fully prepared. The flight to LeTouquet was really easy. There was a very high thin overcast that kept the air still and smooth. As the 90 minute flight wore on, the visibility grew progressively worse, even though I was flying at 4500 feet. At one point a broken layer of cumulus clouds developed under me, and I considered going down under them, but I decided to stay on top as long as I could still see the ground. When I got within radio distance of LeTouquet, I dialed in the ATIS weather broadcast and discovered that the ceiling was down to 700 feet! The conditions had worsened instead of getting better! It is a good thing that I didn't go down under the cloud layer. If I did, I would have run into lowering ceilings, and the visibility was down to minimums. It would have been a trap. I had plenty of gas, and I could have gone to the alternate airport at Abbeville, but I decided to fly around on top for a while and see if things got any better. Sure enough, the ceiling went from 700 overcast to broken and then to 1400 scattered, and then I radioed to the tower that I was coming in. On left downwind for runway 24 I had to stay real close to the runway because visibility was so bad I thought I might lose sight of it. And then there were the scattered clouds in the pattern to deal with: I stayed up over them, but with my wheels dragging in the clouds just to keep low enough for a landing as well as to keep the runway in sight. I turned base and final and dove between two clouds and got on the ground with a great sigh of relief. I refueled, had a quick lunch, got the weather on the other side of the Channel (looked good), and jumped in for my first, and eagerly looked forward to, crossing of the English Channel. I really wanted to land in a place where they talk English. It would be the first time in two-plus months that I would hear everyone speaking something I could understand. I may have been overly enthusiastic about "getting there" because of what happened next. As I was taxiing out to runway 14, the same one I used on landing, the wind kicked up a good bit, and changed direction, and the controller asked if I would prefer to use runway 24, more aligned with the wind. All of my preflight planning was based on using 14, and I had noticed a newly forming layer of scattered clouds blowing in from the south, but they seemed to be dissipating before they got to the airport, so I figured it would be ok. But the change in runways at the last minute threw off my plans. The forward visibility from the holding point of runway 24 looked ok, but not great. There was a lot of haze and it was difficult to tell where it was haze and where it was cloud, if any. It was easy to tell when looking in the other directions, so I figured it was all the same, and I gave it full throttle. As the airplane lifted off and approached the end of the short runway, I was completely engulfed in a thick fog that was lurking behind the haze. I was less than 200 feet in the air and I could see NOTHING except gray. Gray in all directions: up, down, sideways. I was flying completely blind. I have trained for, and received, my instrument pilot rating, but it is not current. I took the training solely for the purpose of knowing what to do if I ever got into a situation like this. And I have been in this kind of situation only once before, very briefly, about a year ago. It's not something I want to practice! So here I am, doing an IFR (Instrument Flight Rules) takeoff, illegally because I am not a current Instrument pilot, but I'm not thinking about the illegality of it right now, I'm thinking about staying alive. There is only one thing to do and that is climb. My eyes are riveted on the airspeed, artificial horizon, heading indicator. Keep the wings level, keep the airspeed at climb speed, full throttle. Sooner or later I have got to climb out on top of this stuff and then maybe I can figure out my next move. And sure enough, what seems like an entire lifetime later, I finally break out on top. What now? I consider going back and landing because I have just had the living daylights scared out of me and I would like to relax for a while, but that would gain nothing. 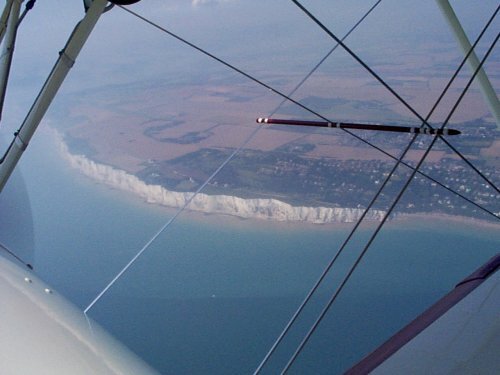 I'm already on my way for a Channel crossing, the weather is better on the other side, so I keep on climbing and head north along the coast of France until I get to the point where the Channel is narrowest, between Calais France and Dover England. The only problem is that the air is steadily getting more and more hazy, to the point where it is almost impossible to tell how much visibility there really is. I can see straight down, but only barely. I can see nothing of the coast of England. When I turn in that direction all I see is gray/white. I keep climbing, all the way to 6500 feet, and there is no improvement. It just makes it harder to see the ground. Do I continue, or go back? With the way the clouds were coming in at LeTouquet, it's probably socked in by now. I could go land somewhere else, but that would be going backwards. It's only 25 miles of open water to Dover England. I'm not worried about the engine quitting, strangely, but I am thinking about the visibility. What I have here is IFR in VMC, a condition where measurable visibility is (barely) good enough to be VFR, but since there are no reference points within the visual range, you are really in a virtual IFR situation. So technically I am legal to do the crossing under these conditions, but am I skilled enough? Concerns nag at me. What will happen if I get disoriented (vertigo) because of no visual cues? Will I get sick? I have never gotten sick in an airplane. Will I go unconscious? I haven't before, but just the thought of getting dizzy makes me kind of woozy! Hey, calm down! All I have to do is watch the instruments. Keep my altitude (plenty of that! ), keep the wings level, and I should be able to make out the other coast in about 10 minutes. A very, very long 10 minutes. And I'm not just thinking about me up here in the soup. There are other airplanes crossing both ways under these same conditions! So what really concerns me is meeting up with one of them, as in "mid-air". Soon there is something forming, a shape like a row of clouds, down low and in front of my left wing, far away. But it's too well-defined to be clouds. It's the "White Cliffs of Dover"! It's England. I'm saved!! I did it! Now I can get down from this ridiculously high altitude, follow the coast southwest until Lydd airport shows up. Piece of cake! And it was. Barry Tempest has been flying for a LONG time, doing air shows in the Sixties. Now he is the Head of Sporting & Recreational Aviation Section of the Civil Aviation Authority in England. He wears a hard-hat when he is flying, just like I do, which is very uncommon in open cockpit biplanes. 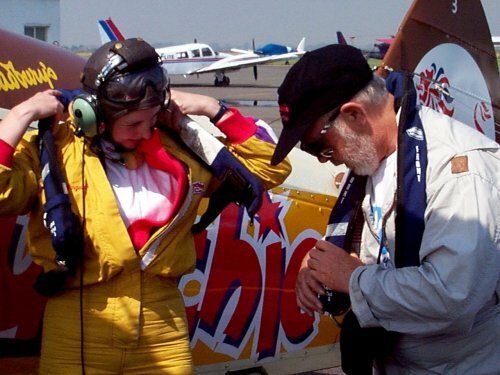 When I mentioned it to him, he gave me, and autographed, a photo of the instant when the plane he was flying was hit mid-air totally destroying both planes on impact. He fell 150 feet to the ground, wearing a hard hat. The helmet was shattered, but he's still around telling the story. I walked around the center of Rye for a little bit, found an old book store and was lucky to find a couple of rare first editions about some WWII aces, one German and one English. I also stumbled on a very old (12th century) church, and was drawn inside by an overpowering need to say "Thank You, God" for coming out of today's flights alive. At dinner, I sat behind an old woman who was dining alone. On my way out, I had the cashier put her bill on mine, and asked that she be told only that "a friend" took care of her bill. A random act of kindness! What's getting into me? I must be happy to be alive!